Sam and I walked both the NY NOW gift show and National Stationery Show this year. Both of these are trade shows, where brands sell direct to retailers. We talked to many of these businesses, and realized that there is so much potential for them online. there is a proven demand for your products. What should you know when going from wholesale to retail – how can you combine the two and make them both work? If Paper*Source or Anthropologie or The Land of Nod or other large retailers buy from you, that’s a clue. That tells you that these experts are confident that your product can sell. And if they can sell your product, so can you! So many businesses start with online retail first and have to grow slowly. But with the wholesale brand you’ve built up, you can skip that slow growth period. It could be straightforward for you to quickly ramp up a busy, profitable ecommerce site. There is a learning curve for driving traffic to your own site, and we are able to assist with that. One thing surprised me when I did some research on the businesses that exhibit at the big trade shows. For some of them, their website was obviously an afterthought. Or it had been many years since it had been relevant or effective. I would see such a mismatch. On the one hand, they had put a ton of time, effort, and money into building a stunning show booth. Then you would look at their website, and see that the same thought and care hand’t gone into its creation. This doesn’t apply to everyone, of course – there were many well thought out websites. But I was surprised by how many of the bigger and more established brands had a sorely out of date website. Now, some businesses have decided to be wholesale-only. Others have a retail website, but sales on their website are kind of a “bonus.” It’s not the heart of their business, and they haven’t put a lot of care into the customer experience . This is such a shame. Your wholesale customers and retail customers both use your site to learn more about your brand, stay in touch, and make purchases. People do all their research online these days. Your online home should look its best, so people will find your business relevant and compelling. Establish and reinforce your brand. You want your retailers to get the same feeling from your website that they get in your booth. The professional booth can look like a “false front” to an amateur business if your website doesn’t align with the high standards you set for your brand. Demonstrate the value and selling points of your product. Your website can actually help your retailers sell your work themselves. It can help them truly “get it,” and know how to talk about your brand, or how to display it, or what to pair it with. Build a following. Today’s retailers know that most designers will be selling their products online themselves, and you don’t have to worry about competing with most retailers (aside from not underpricing them). In fact, if a retailer sees that you’ve built a loyal following, that can give them confidence that your brand is worth investing in. Keep you in touch with your customers. When you’re running your own online shop, you’ll be able to learn from your customers’ questions, see what sells and when, learn which things often sell together, see what gets returned and why. The wholesale relationship distances you from your customer. With a retail presence, you have access to the information you can only get directly from customers. Test out new products. It can be slow and expensive to test out new product ideas with your retailers. On your own website, you can create a limited run of a new product and find out if it’s something your customers want. Having a real-time relationship with your customers can be a great way to add to and adjust your product line based on their feedback. Make more money! Though there will be costs associated with an online shop, you immediately can sell at that higher price that your wholesale customers sell your products at. That additional profit can be a wonderful income stream, and a great way to grow your business. Smooth out cash flow. If you rely on wholesale orders, it can be nerve-wracking waiting for a big order, or finding out that a retailer is dropping your line from their stores. Is income for your business uneven, based on retailers’ buying cycles? Having your own shop can be a great way to smooth out cash flow, and rely less on the whims of other businesses. It can be mystifying to a business that hasn’t dabbled in online retail – how do you get customers? A trade show is an investment, but you just need to show up, and the customers will begin walking by your booth. You then can do your best to get them to pause and take a look around and get interested. When you set up your own online shop, it can be hard to figure out how to get people to swing by your site and take a look. With your own website, no one is going to show up unless you go out there and get them. It can be confusing figuring out how to do this consistently, particularly if you haven’t built a following. A large mailing list, or engaged social media following are worth their weight in gold here. Without that, it can be hard to know how to begin. If you are used to selling your work to wholesale buyers, know that getting traffic to your website is a different thing. If you haven’t been seeing strong sales on your own website, but you do sell a lot of your products in other peoples’ stores, let’s talk! We can work together on how to get your retail side as busy (if not busier than) the wholesale side of your business. To do this, you want to start with an effective website that converts a good number of your visitors into customers. From there, I am guessing that you have enough going on with your business that it’s not the time to learn the complicated skill of getting traffic to your site. Instead, I’d suggest working with our marketing team to come up with a strategic plan to build a following and drive traffic. Your business is outstanding and you know it. Why not leverage the desire for your products by running a busy online shop as well? Please get in touch if we can help with anything to do with your online sales right now. I’m glad to give a bit of advice, or answer a question. And of course we’d love to create your custom site and help you keep it busy. Pairing our website work with smart SEO and marketing strategies will get you rolling. Want to get started figuring out how to do this yourself? Grab our workbook to research and pin down what you know about where your best customers are hanging out. 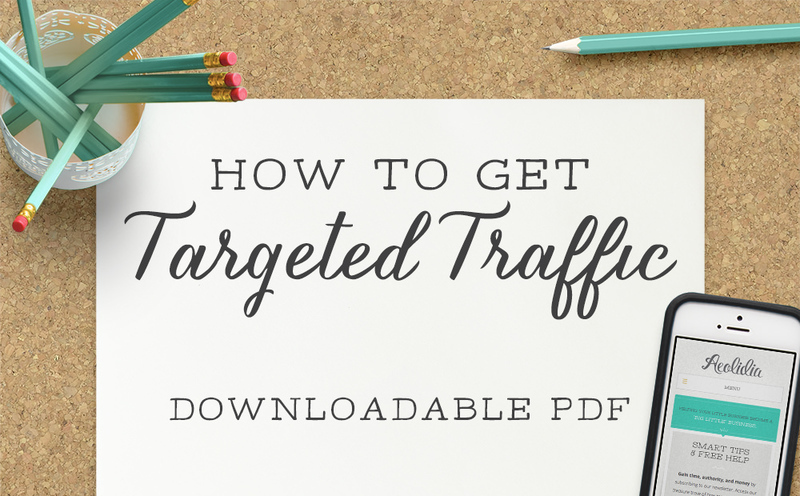 It explains traffic-generating concepts in more detail, and you can use the included tips to make a plan to get high-quality, high-converting traffic to your website. Great article. Any tips on a simple, slimmed down software program for inventory tracking?